I purchased my sheltopusik in February of 2000. When fully stretched out, he is about three feet (one meter) long. 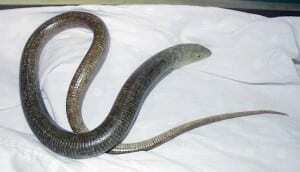 The sheltopusik, also known as the European legless lizard, certainly does not look like a lizard at first glance; it is long, thin, and lacks any functional limbs. As a result, it is commonly mistaken for a snake. (It’s name, in fact, means “snake lizard.”) Not having limbs does not make something a snake, however. Snakes have many other special features not present in other animals like lizards. For instance, snakes have a very light, mobile skull that allows them to swallow food items much larger than their head. Most lizards have a much less mobile skull designed for biting and chewing instead of just swallowing. Similarly, a lizard like the sheltopusik has an external opening for the ear and eyelids that can be raised and lowered (like most animals). Snakes lack any external vestiges of an ear and have specially modified eyelids known as spectacles that permanently cover they eye. Movement in limbless lizards and snakes is also very different. A sheltopusik moves in a somewhat stiff, mechanical manner and is not capable of forming the tight coils so typical of snakes. Like plated lizards (and unlike snakes), sheltopusiks have a fold (or groove) along the side of their body near their belly that expands and contracts as it breathes. The fold extends from just behind the head to the base of the tail, a point about halfway along the total length of the animal, marking the site of the cloaca. Everything in front of the cloaca is the body and the rest is tail. In most snakes, the body is proportionately much longer than in a sheltopusik, and the cloaca is located closer to the tip of the tail. The reason sheltopusiks do not have any limbs is the same reason many other lizards have become limbless: a burrowing lifestyle. Sheltopusiks live in the underbrush, burrow through soft substrates, and eat invertebrates and small vertebrates they encounter in these habitats. For these animals, limbs mostly just get in the way. And since it takes valuable resources to grow and maintain limbs, it is much better to lose them through evolutionary time than to have them and not use them. The sheltopusik (like some snakes) still has very tiny remnants of the hind limbs that are visible as small nubbins on either side of the cloaca. Sheltopusiks are native to far eastern Europe and western Eurasia and are not commonly encountered in the North American pet trade. However, they are very easy to care for and have a reputation as living for a long time (more than 50 years in captivity). That makes them a good investment as far as a lizard is concerned. 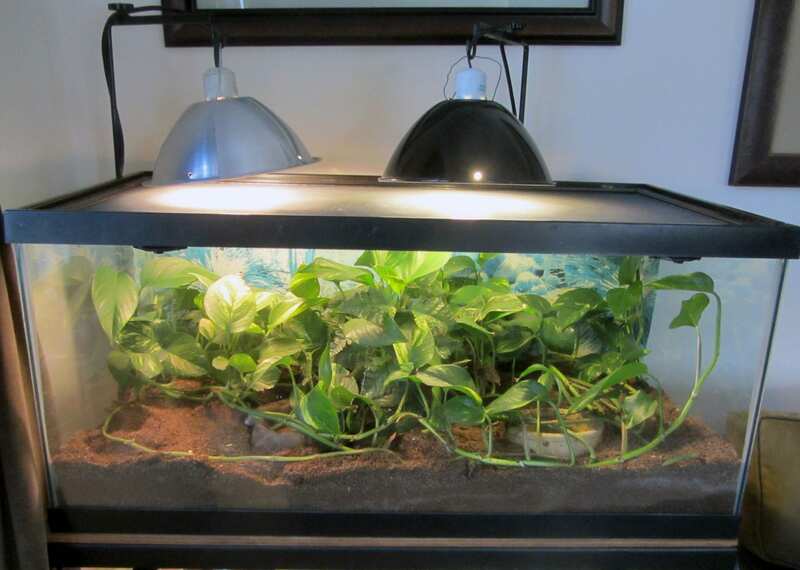 I keep my sheltopusik in a 40-gallon breeder aquarium (36″ long x 16″ high x 18″ deep; see photo) with a snake-proof lid. (Mine pushes on the aquarium top periodically, so a secure top is essential.) Although I originally used a natural (soil) substrate for the tank, I have subsequently found that Bed-A-Beast (made from ground coconut husks) is preferable. It is much cleaner, great for burrowing, and holds moisture well. Additionally, it makes it is easy to see and remove lizard droppings. I keep a medium-sized water bowl in one corner of the tank and usually let the water overflow whenever I fill it. The bedding around the bowl absorbs the water, giving the sheltopusik a dry end and a moist end of the tank to choose from. 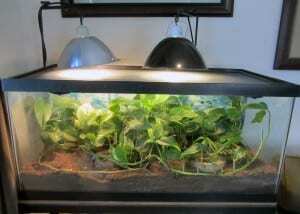 Since the sheltopusik is not a basking lizard, I don’t use any special UV bulb. Illumination is supplied by a compact fluorescent bulb and heat by a clip lamp with an incandescent bulb. My sheltopusik generally eats just three things: nightcrawlers, canned cat food (any type), and mice (dead). The sheltopusik is not a huge fan of being handled, but his protests are more show than anything else. When picked up, he spins around in an attempt to get free and lunge and hisses like he is going to bite, but I have never actually been bitten. If you hold the lizard loosely in the middle of its body, the lizard will spin but not be able to get a grip and will eventually calm down. A friend of mine in the Chicago Herpetological Society told me he was once bitten by a sheltopusik and that they can give a good bite, so it never hurts to be too careful. Still, I think unless food is involved, the odds of being bitten are low. 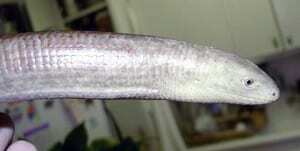 Sheltopusiks are closely related to a group of lizards living in the United States known as glass lizards. These limbless lizards get their name from their tails, which can not only be dropped but can also break into several smaller pieces, like shattered glass. Although a sheltopusik superficially looks like a snake, its head is much more similar to that of a typical lizard. An interesting thing I noticed while watching Raiders of the Lost Ark is that – in the scene where Indy is lowered into the tomb filled with snakes – most of the “snakes” are actually sheltopusiks. (I did some searching on the web, and could find only one article that mentions this fact.) Why the producers of the film decided to use so many limbless lizards instead of snakes, I have no idea. Maybe many of the actors actually did have a fear of snakes. But as far as I know, it represents one of the only instances of sheltopusiks having their 15 minutes of fame.